Hey, my lovely readers! It's been a while since my latest outfit shot. Recently I have talked about beauty and personal stuff, so now back at it again with outfit of the day! Last week I wore this all white outfit from head to toe. 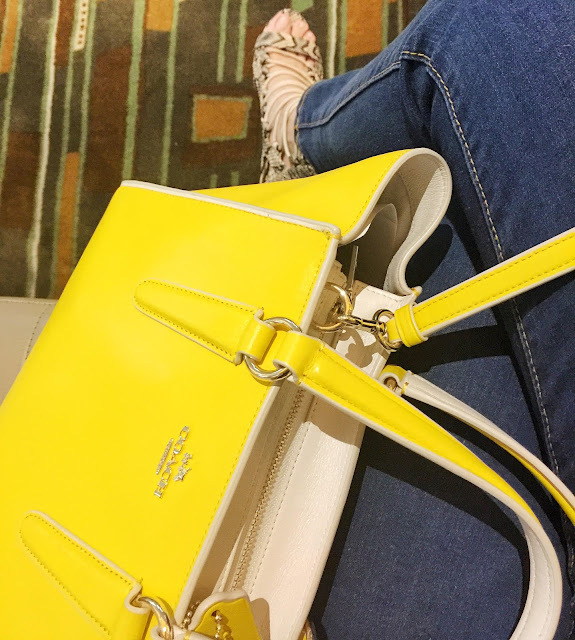 None of these are new, I've been through to my closet try to mix and match everything and I decided to pair this long blazer vest in broken white, white bralette and white pants, and another white ankle heels ;) Of course, to pull off this look, I guess I need something bold, which is this lovely yellow purse from Coach! I love this bag a lot, it's not too small, you can still put some of your main items inside this bag. It's important to me, because I usually bring a lot of things everywhere, basic things like phone, wallet, tissue, wet tissue, BB cushion etc. So, even the trend now is the smaller the better, I still prefer a slightly "bigger" purse, and this is absolutely perfect. Anyway, I feel like this edgy look brings out the mature side of me, many celebrity also love to match this kind of all white look, like Emily Ratajkowski, Kylie Jenner, and many more. So, what do you think guys?